JUDGING: BIASED OR IGNORANT, WHICH IS IT TODAY? Take Your Pick, Which Is It Today? Authoritative breeder-exhibitor assessment on why complaints about quality of judging are better founded than at any time in AKC history. "As I reflect upon the Boxer judging at the recent Celtic Classic shows, I find that I cannot hold my tongue regarding the exceedingly poor quality of judging." I have worked hard for 43 years to produce quality dogs. 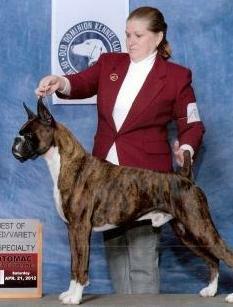 I have been fortunate to have owned and/or bred some of the top producing Boxers in breed history. One can not hardly look back 10 generations in most current pedigrees without finding one of my dogs. I was also married for 11 years to an AKC licensed handler from the days when that title had true meaning and handlers reputations were made on the quality of their show string. What I saw in both the classes and the "NOT SO SPECIALS" class was not very noteworthy. Least noteworthy were many of the professionally handled dogs. Having said that, I have to wonder what is going on at the dog shows today when so called "Top Handlers" walk into the ring with dogs that years ago one only saw with the "Scab Handlers" and yet today they proceed to win. I can appreciate the need to make a living but what does taking mediocre animals to their championship do to the breed except diminish the quality and the value of that championship title? It appears to me that neither the handlers nor the judges seem to realize or care that they are the stewards of a breed’s future just as much as the breeder. In the case of these particular shows, none of the judges had significant experience judging Boxers. For the Specialty show the replacement judge has only adjudicated Boxers for a few shows and had small entries at that. The show giving club should never have given such an inexperienced person the assignment. On the entire circuit, in almost every instance the judges put up dogs who either lacked good breed type or worse yet had poor canine anatomy and movement, even when more suitable choices were available. One does not have to be an expert on breed type to know that Boxers do not run downhill, stand high in the rear or have toplines with 3 distinct sections. Movement faults such as crossing over, hackney gait and paddling are obvious and not correct in Boxers, or most other breeds. That is Dog Basics 101. More to the point is my question to AKC - Who is mentoring these judges on the breeds? How much is required of them and where is the AKC rep these days. Many years ago they would sit and observe newer judges and counsel them if they went astray. It must be an easy decision for a judge to just go with the big name handler, ignoring the 2nd tier handlers or even the owner handlers. As an owner handler, I can tell you this happens a great deal. 35 or 40 years ago, showing in Bred By was the proverbial Kiss Of Death. Now that professional handlers are also breeders, that class has been taken over by the Pros. AKC throws a bone to the owner handler with the AOH class, making it the new Kiss Of Death class. It is a nice class that affords an opportunity to get into Winners in order to train the new dog or work through problems with an obstreperous dog in training. Unfortunately, the same two things that happened years ago in Bred By are now occurring in AOH. Judges (who may or may not have much handling experience of their own) feel compelled to give handling lessons to the exhibitor, and worse yet, they walk right past you in Winners as if your dog must not be any good if you were stupid enough to enter this class. It’s a real shame to watch this happen, as from my personal perspective and that of many long time breeders who were spectators at these shows - the better dogs were either owner handled or with the 2nd tier handlers. If the judging at these shows was not somehow biased then one has to question the fundamental knowledge of canine anatomy and function of this slate. The choices here are if you were not biased, then you were ignorant and neither choice is a good one for the breed. Judges are entitled to their opinions but that decision should be based upon a solid foundation of canine anatomy and movement. If they are having difficulty with the nuance of breed type then there is nothing wrong with going out for a refresher course. There are plenty of knowledgeable successful breeders who would be more than willing to give of their time to mentor. One should never stop learning unless the raisoned'etre at dog shows is an ego trip and if that is the case we are all lost. The quality of dogs will continue to diminish as rapidly as the number of mediocre champions rises. More and more of those who breed quality dogs will cease to exhibit.